Virtual System Tables (VST’s) were added in V8.2. VST’s provide access to data that was previously only accessible through the promon utility. 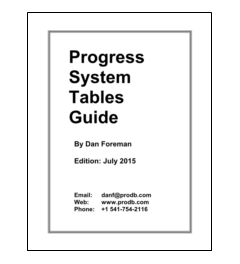 The Progress documentation gives a basic description of each Virtual System Table (VST) but is generally inadequate for anyone attempting to do so serious work with VST’s. This publication also has information about the Metaschema, SQL Shadow Tables, and more.